The members of this group originally came together around issues of historic research and preservation, and because we were genealogy buffs. We have expanded and become an experienced group of paranormal researchers. We still believe that education and sharing knowledge is the most important reseason to do this work. We feel it is imperative that people place their trust in ethical research groups, and groups that do not claim to know any absolute truths about this field of study. We never charge for our sevices, and we do not condone charging fees for work in in an area that has no definable boundaries. If you should wish to thank us for any work we do for you, your family or business or community, we ask that you please donate your time and efforts to a local historic preservation group in our name. And remember, offering a cold glass of water or a cup of Tim Horton's coffee cant hurt! We appreciate your well wishes and warm thanks. This is a document originally written in 2003. We still use it as a guide, and we still think it is a great overview of what we do. Disclaimer: We have experience doing paranormal investigations. We read. We study. We discuss. We learn everyday. We theorize and hypothesize. Please take everything anyone (at STORM or elsewhere) says about paranormal studies, spirit research and psychic investigation with a grain of salt. Because of the nature of what we do, we can only share our opinions and our current beliefs. We do not claim any ultimate knowledge or truths and we understand our beliefs are growing and changing as we process down our individual and group paths. If you are going to go somewhere you believe may be haunted or otherwise experiencing paranormal...stuff, you should take a few very simple steps beforehand to ensure the physical safety, mental & emotional well being of all of your investigators. It is important to go into any investigation or event with clear intentions. 2) your question: Why are you there and what do you want to do or know? Are you clearing an area of lost/wandering/cranky spirits or helping lost spirits reach "the other side?" Are you proving that whatever caused the event or anomaly was man made or manipulated? Are you asking spirits about something unknown or a particular big yes/no question? A ghost hunting pack that includes your technology items, maps, batteries, flashlights and a first aid kit. Yes, all that stuff. Really. Bring a good map on your event. If you do not need it to reach your destination, bring along a drawing or floor plan of the house or space you are investigating. Don’t forget basements and attics and yard spaces if your property has them. If you can get a cemetery plot map, or transcription, or place history, it will be very helpful. *If you consider yourself intuitive or think you feel psychic energies, you may want to wait on investigating the history and families surrounding your event until after your first meeting/visit so that you can explore without preconceived notions and come back a second time with clearer intentions. Wear good shoes (no flip flops or stiletto heels) and comfortable, weather-minded clothing. Nothing reflective and leave the “bling” at home. Its important that if you are looking for valid documentation of activity you take into consideration any type of reflective surfaces you bring with you. Camera straps, tennis shoes, earrings and wedding rings all can cause light anomalies, so leave the bling at home, tape up reflective tennis, and turn your wedding rings Rock –in. A small, cheap fold up rain poncho may come in handy if you will be outside. Bring a few flashlights. One per person would be great. At least one with a red or blue lens or red film transparency over lens is good idea to help see in the dark without bright lights blinding everyone, bothering neighbors or cars, and possibly interfering with night vision video. Bringing some small pruning scissors or something to push away debris/overgrowth from tombstones, etc is smart IF YOU HAVE PERMISSION TO DO SO. A good working compass is more handy than you would imagine; if not for using to find your way around in wooded areas or confusing hallways, then to note anomalies if the compass needle stops working or spins erratically. -also, bring a bandana or handkerchief, extra batteries, extra film for cameras, and at least one lighter (matches burn out quickly and may get wet or damaged.) Baby powder is a good ghost hunting tool also, as well as some very light “indicator items.” More on those later. We recommend each person has a camera (disposable or 35mm, or digital) with them. It would be great to have at least one camera with infrared film with the party. The best film seems to be 35mm and 800 or 1600 speed, but anything will do. Digital cameras are really good for monitoring the space as well as for manipulating color on computer later – adjusting contrast to see orbs better, etc. That also may skew results or invalidate photos for evidence purposes, so be aware of that possibility. It’s best to have both just to be sure in hopes of catching weirdness in more than one way. 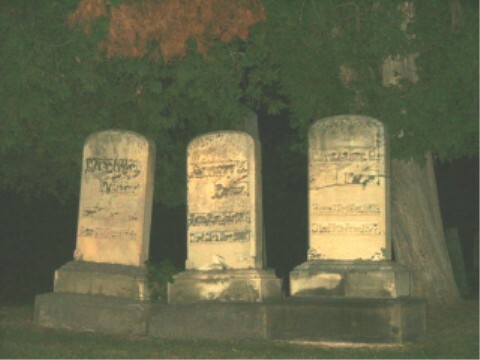 If spirits or anomalies want to be in photos, they will be- day or night. Respect the area where you investigate and try to leave everything as you found it-no trespassing and no littering of any kind (even gum or cigarette butts.) The one exception would be gifts for spirits - more on that later. Doing any kind of investigation or "spirit hunting" while impaired would be a really bad idea - no drugs or drinking during or before an investigation. Also- smoking will disrupt air flows and add substance to the air that may alter photographs and skew reports, so smoke only outside the investigation area. If you do investigate paranormal activities, do it respecting that whatever you are investigating may possibly be spiritual in nature, and may even be someone, some-where's (dearly departed/not so dearly or departed) ancestor or family member. Go with goodness and kindness in your heart. Feel safe and emotionally secure in yourself and with your companions. Ritual or habitual behaviors may have some power and strength and energy. Take with you (as individuals) some personal item you consider comforting. Most people choose to carry a stone, crystal, coin, ring, jewelry or other pocket item. Try not to take expensive or irreplaceable items, as often they may unexplainably break or get lost. -salt. Throw a bit over your own left shoulder before you reach your destination. To protect your cars: make a large circle of salt around your vehicle while saying out loud: "This is a safe space. This vehicle is blessed and filled with goodness. Nothing can enter but goodness, and nothing can harm this vehicle or these people. This is a safe space." This is just a ritual. You can make it up. To protect your party: you can form a circle and go around passing a bit of salt hand to hand and saying good things and hopes for the investigation. End with a phrase you will always use or a specific prayer you make a habit of saying. It may help, but it wont hurt. It helps to state your intentions for a safe event and focus on the positive investigation. -reminder items for your party . Reminder items are things that have meaning to you as a group. We suggest a Bible, a large cross or crucifix, and several larger crystals. Leave them in the car or in the backpack; the only reason to have them with you is to remind you of your own strength or personal faith. Some people believe you can store energy in crystals, and that would be reason to bring an energy battery-crystal on the investigation. Once again-it cant hurt. If its too heavy, or not your thing, leave 'em home. -some people like to bring a gift to the spirits . It is said that "spirits" enjoy "spirits" and it is nice to bring some wine or alcohol to pour out at the gate or entrance to the area you are investigating. While the passionate nature of alcohol can’t be denied, the simple act of gift giving is enough. Bring some candy, cracker crumbs, cookies, juice, sparkling water or soda pop and achieve the same effects. It proves your intentions are selfless and well-meaning, whereas alcohol may incite spirits who were harmed in life by alcohol. Reminder: Pour or toss only biodegradable items down, and take trash items back out with you. As an investigation party, gather together beforehand at your vehicles at a rendezvous point outside the area you wish to investigate (a home or restaurant or neighborhood street is best.) If you believe in prayer, say a prayer; if not, say a happy thought and state your kind and good intentions for the event. Have a set plan before to leave your rendezvous point. You can investigate an event with as little as two people, but it is best to have a party of 3-4, or a couple of parties of three or four, giving each person one or more specific roles to play. Never investigate alone! At this time, decide who will do what while on the investigation. This part of the guidelines (below) is harder to stick to, and yes, some rules were made to be broken. It is a great guide and is the ideal situation, especially if you and your 3 best friends investigate together. if there are more of you, it gets harder. and you never know what the spirits will encourage you to do and who they might want to show themselves to! Use this to develop your own groups plan, and please: let us know what works for you. Choose ONE PERSON to be your main speaker (one per party if you plan to divide up.) The speaker will speak your party's intentions out loud while on the investigation. This person will be in charge of speaking to the energy or spirits. Yes really. But if the unexplained spirits/energy wants to speak to someone else, hey -let 'em! Whatever works! Choose one person to be the navigator. They will carry the physical map or floor plan and make sure you have enough physical information on your area, as well as keep the location of all members of your group and each party. Your speaker or your navigator may also be your intuitive person/psychic, or the person who is able to use dowsing rods or other methods of divination or psychic navigation. Choose a person who will be your event groundskeeper. That person is in charge of wiping away debris from tombstones, holding back or if necessary cutting back, overgrowth of plants(if allowed! ), etc, also in charge of making sure no trash or litter of any kind is left on scene. Choose one person to be the record keeper. The record keeper is VERY important and the validity of the entire investigation may depend on accurate locations, timetables and notes and records of device readings, etc. The battery persona nd record keeper are often the same since you will want to know how much batteries you have used, etc. Record keepers will also be aware of weather situations beforehand and the moon phase and visibility. You may also need a "tech" person who is technologically knowledgeable and understands and will be able to use and read and maybe even fix items such as EMF devices, audio recorders, video cameras, night vision cameras, & thermal imaging devices. Depends on what you have and are usuing and if you need this person during the investigation or back at home base or for editing later. *If you have more than one party on a given site, you should choose to have one person be the event lead or organizer. This person should be in contact with each group in your party (walkie talkies are good) and know where everyone is at all times, and should also know what readings electronic devices and compasses are giving and what steps and direction the event investigation will take. This person could also be the navigator. Travel to your destination with your people, your plan and a timeframe in mind. Upon arrival, your navigator or lead person will check in with anyone you need to check in with, such a security/police, grounds attendants, or homeowners. Give them a count of your group members on their site and the contact number to the lead or navigator. They usually like a timeframe of when you will be gone also. Your speaker will speak your intentions out loud to the spirits and to the home or park or place you are investigating. Your lead or navigator will then direct the investigation either geographically top down, bottom up (attic or basement first) or by using a psychic/intuitive/sensitive person to direct your party to an "active" place of unexplained energy, or maybe by using pendulums or dowsing rods to indicate direction. *Even if there is no person to check in with, begin your event with some words of intention out loud. Ask, out loud, permission to enter, and ask the spirits or energies to guide you and help you find them so you can know them, record them, remember and help them. Speak out loud your party's intent to bring peace to the place where you are. Note: there has been some ideas about not asking permission to investigate and record, not telling the "spirit" occupants of a location what we are doing. It seems we get much more responses when we do not ask permission first. It almost feels like we are trying to trick the spirits into making themselves known, and we are not really sure about how we feel about that yet. In general, we think provoking spirits is bad and unneccesary, and we try to only add good energy and not add anything negative. It depends upon the nature of the investigation and the request of the family/business owner as to how we handle each situation indivually. Always with respect and honoring their wishes. Remember that most people believe spirits or unexplained energies cannot themselves harm you. With that knowledge in mind, it is still best to take precautions against accidents, getting lost, and against the accidents that fear itself can cause. Bringing peace and going with goodness and the grace of God helps reduce any fear that may cause accidents. Fear is your body's indicator that you are near something unexplained and are therefore to proceed with caution. Use your senses. You may not see anything with your naked eyes, but you may be able to use your other senses to help guide you to where the energies are. What do you hear? Wind? Trees and leaves? Creaking floors? Watch each others feet and note when you hear footsteps and who made them (or didn't.) Can you hear music, whispers or human sounds not made by your group? What do you feel? Is your skin goosebumpy? Did the temperature change or direction of wind change? Are you getting a headache or nauseaous or dizzy at all? Do you see a valid reason for this or are the causes unclear? Does it get worse or change when you travel in any particular direction? What does the place smell like? Has the smell changed? Have you noticed a particular smell (perfume, burning wood, rotting or moldy smells, flowers, etc.?) Did it accompany anything else unusual like other senses being stimulated? Help confirm any changes or weirdness or directional pulls you may be feeling by using equipment, including dowsing rods or pendulums. Remember to check your compass, thermometer, EMF detector and any other equipment you may have often. Watch where you are walking- don’t trip! Take notes on everything-what time, temperature and location everyone is in and systematic readings from all equipment and participants. Note changing smells and any weirdness at all, including when people get goose bumps or when their scalp gets tingly or even when suddenly... nothing happens at all. Everything is important. TAKE NOTES ON YOUR INDIVIDUAL SENSORY PERCEPTIONS and note time and place they occurred and changed. Take photos where you feel changes occurring or energies growing stronger. Its helpful to record whenever you take each photo and what you expect to when you get the film developed. Maybe you do not want to waste film, but remember you are taking photos of the "unseen." It is a good idea to have a digital camera with a monitor so that you can see immediately what you are taking pictures of. This can help you compare with your equipment to find directionally which way to go for more activity. Take readings on your recording devices at set intervals and then again whenever you feel energy changes. Be prepared for sudden noises or unexplained lights or sounds. Sometimes spirits want to get your attention and do it any way they can. Sometimes cranky or unhappy spirits might even like to scare the living by making bumps and sounds. It is just noise or light--- you are filled with goodness and clear intent to help them, no worries. But... make sure everyone in your party is focused and safe and positive. If you sense really bad stuff, really despairing or evil feeling, or even just something more than you can handle right then, feel free to vamoose the scene! If you are feeling afraid or nervous or anxious, you can do what we do - put chaos in its place. Say out loud that chaos has a place, and denote a particular small area where you allow chaos to be. Command it to stay there (in a corner area of the cemetery or park or road, or in a particular tree or bush, preferably at some distance outside the home or area you are investigating.) This allows for the existence of negativity while not allowing it to interfere with your work. Remember that if darkness is the absence of light, and cold is the absence of heat, then chaos is the absence of peace. There is no inherent evil in and of itself, only the absence of goodness. There is nothing to fear if you have goodness, peace of mind, and clear and focused intentions. If you have intentions of "clearing" an area of its unexplained presence, consider the implications and energy needed to do this. You are attempting to banish the spirit (or memory energy, or electrical impulse, or unexplained hobgoblin-y thingy) from this place to another better plane of being or even non-being. You may wish to clear a trapped soul from an eternal existence of ghostly-ness. All of these ideas are positive & good, but may take more energy than you are used to or even capable of. For some people and some events, clearing the spirits and releasing the pent up energy may be as simple as saying something similar to the following out loud TO THE ENTITY: You are a child of God. You are loved and forgiven through the grace of our creator and in goodness you shall go on to the light. Leave this empty place and go to the light. Your chores are completed and your work is done. Leave this loveless place and go to where you find peace. Let your energy seek out the highest places. You are forgiven by God. Leave this place now and in the name of God who is goodness and love be released. Go! This may be difficult for you to say if you are not a person of faith. Try saying something similar that tells the entity go into a peaceful plane of being, and tell them they are loved and deserve to be released. That should do it, especially if you are trying to be non-religious, multi-inclusive, or just don’t feel comfortable talking "god" or "creator" stuff. I recommend if you know who or what you may be dealing with, go with whatever you think the spirit believes. Know that some entities have been where they are a very long time and are keeping company with the people who live with them. Some private homeowners and innkeepers, etc may actually enjoy the presence of "unseen others." Try not to be selfish, though. Realize that if a spirit really is trapped or lost, it is without peace or God/family/others of its kind. It may seem to be part of your family but it may be a lot older than you think and eternity is longer for the spirit than it will be for you. Consider releasing your family ghosts or building ghosts who seem harmless and friendly but who are basically spirits lost between this world and another. This does not mean you must live without the memory or presence of your deceased loved ones! This does mean making sure that who or what you are feeling or living with is in fact a repetitive memory energy only, an occasional visit from a departed loved one, or a guardian spirit/angel, not the presence of a lost, or trapped, or unhappy entity. Have fun and spread the peace & friendship that comes with spending time investigating phenomena with good people. Be as light as you can when dealing with such weighty issues as life and death and fear and loss. The more peace and heart we can bring to the situation the more activity and insights we can document and be in evidence of. Dont forget to share your experiences with family members and friends, post your experiences online, publish your findings (with proper permission of course) in journals or magazines, and in general spread the word that we must respect the unknown.